In June 1974 history was made at a supermarket in Troy, Ohio, with a ten-pack of Wrigley’s Juicy Fruit chewing gum. It was the first time a commercial item bearing a Universal Product Code was scanned by a cashier at the checkout. Forty years on, the barcode has transformed the world of commerce by providing reliable product identification, tracking and pricing. Nearly everything now comes with a barcode. As revolutionary as it was, the barcode has limited abilities, reports The Economist (March 8, 2014). It can impart only the information it was printed with and that can be read by an optical device. 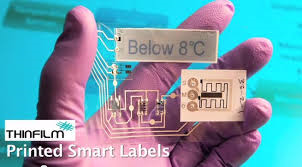 The next generation of labeling contains tiny printable electronics able to generate, store and share information. The technology behind “smart labels” is a flexible film of electronics that can be printed like a barcode. The memory circuits which can be used by smart labels to store information are printed as a film of ferroelectric polymer sandwiched between two electrodes. A tiny 20-bit memory label can store over 1 million combinations. Yet another advancement is called Near Field Communication (NFC). This allows a user to tap an NFC tag with a portable device, like a smartphone, to send or receive data. NFC is a more sophisticated version of RFID and is already used by some contactless payment systems. By incorporating NFC, smart labels will be able to communicate wirelessly. Besides conveying product codes, applications include recording storage times and temperatures for perishable goods like food and pharmaceuticals. Smart labels might even be programmed to automatically discount their prices in response to marketing campaigns. To gain widespread use, smart labels will need to be cheap. Basic printed-memory labels can be produced for around 2 cents. Printed sensor-labels cost 50 cents, compared with $10 or more for a system using conventional microelectronics.